Bristleworms in reef tanks are completely normal, but whether you want them in your tank or not depends on what kind you have. While sitting in front of the aquarium recently, watching all of the activity, I noticed a pinkish-purple arm that kept protruding from a hole in one of the rocks. I watched it for quite a while trying to figure out what it was, and waiting to see if it would emerge. It stayed put and for a couple of weeks I didn’t see it again. Then, one day as I was walking by, I saw it crawling on the sand and ran to grab the camera. It was about 3-4 inches long but I captured only this much of him as he was going back into hiding. I suspected that this was a Bristleworm and did some research to confirm. Bristleworms are from the class Polychaeta, meaning “many bristles”, which is a good description of these worms. They are currently considered beneficial for your tank because they are scavengers of any leftover food and decaying matter. 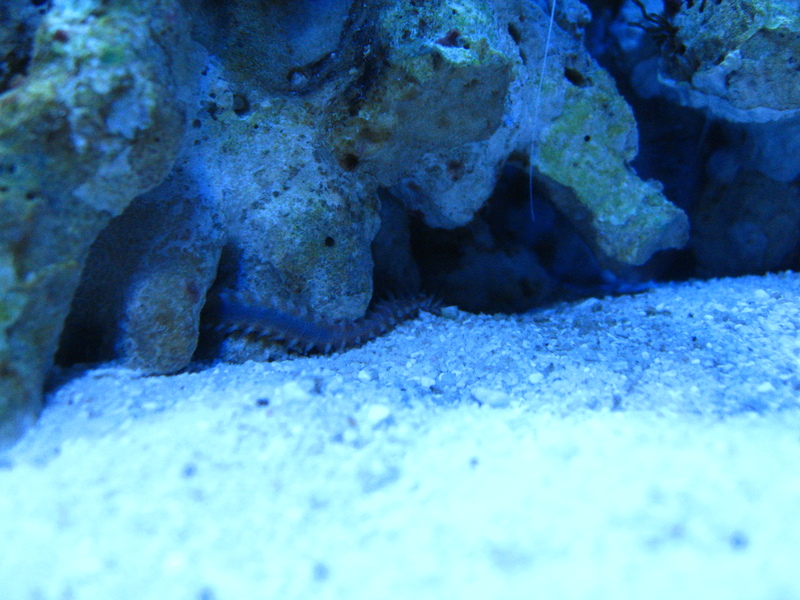 In the past, all Bristleworms were considered bad for your tank and accused of killing corals, clams and fish. Since then, they have become more understood, and the fact that they eat decaying matter explains why some people would think they were eating their fish and other specimens, when in actuality, they were probably eating what was already dead. Bristleworms are nocturnal mostly, and spend most of their time hiding in rocks or in the sandbed. They range in all size and colors and I find that most people don’t mind them in their tanks even if they look a little creepy. There are a few species of Bristleworms that are considered pests that most people will tell you to remove. One type is the Fireworm, which is a large red Bristleworm that gets its name from the sting it gives when touched. Their hollow bristles are sharp and can get lodged in your skin and contain toxins that cause the burning sensation. It is always a good idea to wear gloves when touching any Bristleworm, whether it is a Fireworm or not. The general rule of thumb from what I am reading is that Bristleworms, when small in size are beneficial to a tank, except for the Fireworm. If you have a large Bristleworm and find missing fish or other specimens, further investigation is needed, but it is more than likely not a Bristleworm causing death to tank inhabitants. All in all, they are keepers. This entry was posted in Informational and tagged aquarium, Bristleworm, Fireworm, Polychaeta. Bookmark the permalink.